Weapon Skills are modifiers found on Rare and higher weapons. These skills give stat bonuses to certain types of characters, or provide other bonuses based on the skill. Most weapon skills have 2 parts: the base skill, and the skill level. 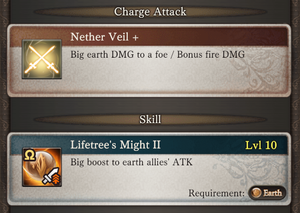 The base skill has a fixed effect, such as "% boost to allies' ATK," and the skill level amplifies the effect by increasing that base percentage. For weapons with maximum levels of 100 or lower, the maximum skill level is 10. For weapons with a final uncap, the maximum skill level is 15 after the uncap is performed. For most weapons, each skill level from 1-10 increases the base effect by 1%, while each skill level from 11-15 increases the base effect by less than 1%. There are some skills that require the weapon to be a certain level. This naturally also requires the weapon to be uncapped enough to reach that level. Refer to individual weapon pages to determine if that weapon has such a skill. The skill level can be raised before that point. Likewise, certain skills will be upgraded/replaced by a stronger skill when the weapon reaches a certain level. The skill level will carry over in this case. Each party uses 1 main weapon and up to 9 sub weapons. This is colloquially referred to as the "weapon grid." The main weapon dictates the element and charge attack of your main character, but weapon skills on all weapons in your grid are always active (apart from a few exceptions specifically stating so) and will strengthen all applicable characters in your party. Normal - Generally found on Draw and older event weapons. The Normal type includes Normal II weapons, Bahamut Weapons, and Ultima Weapons. Omega - Also known as "Magna" weapon skills. Mostly found on weapons named after the Omega raid bosses. EX - Also referred to as "Unknown" weapon skills. Found on collaboration and newer story event weapons. For high-level players, Xeno Weapons and Rose Crystal Weapons are also available. As of November 2016 with A Peace of the Pie, new story event weapons have EX weapon skills unlocked at level 100. Normal skills are boosted by Premium Draw summons, specifically Agni (fire), Varuna (water), Titan (earth), Zephyrus (wind), Zeus (light), and Hades (dark). These summons increase skill power by +80%, increasing to +120% at 3★. Bahamut Weapons and Ultima Weapons are not affected by any summon despite them being considered Normal skills otherwise. Omega skills are boosted by the element's respective Omega summon. Starts at +50%, increases to +100% at 3★, and increases to +120% at 4★. Mysterious skills, a type of EX skill from IDOLM@STER collab weapons, are boosted by the Ranko Kanzaki summon. Starts at 30%, increases to 50% at 3★, and increases to 66% at 4★. For more details on damage multipliers and team building strategy, see Damage Formula and Team Building. Increases Attack for characters of the skill's element (and race or weapon-specialty for certain skills). Different skill types (Normal, Omega, Ex) are additive within their type but multiplicative between types. See Damage Formula for details. Increases the HP for characters of the skill's element. The "Titan's Aegis" skill on the Broadsword of Earth is a flat +500 HP to all characters (+50 per skill level). Unlike Attack Up skills Health Up skills are additive between Normal, Omega and Ex. Chance to deal an additional 50% damage to weak elements. There is a difference between how the game treats Normal weapons skills and Omega weapon skills. Normal: Each weapon has an independent chance to activate a critical hit. Bonus damage is calculated additively, so 3 standard critical activations in the same turn will result in 150% bonus damage. Omega: Total critical chance% is additive from each weapon. Bonus damage is flat 50%. HP reduction is constant regardless of skill level. Medium boost to ATK and Double Attack. See Attack Up and Multi-attack Up for boost levels. Medium increase to Double Attack and Crit Rate. See Multi-attack Up and Critical for boost levels. Small/Medium boost to ATK and Crit Rate. See Attack Up and Critical for boost levels. Skill level does not raise the chance to dodge. Values not tested for Magna but they're similar. Multiple weapons stack additively for both dodge and damage. Increases the rate of double attacks. See Multi-attack Up for boost levels. Increases the rate of double and triple attacks. Capped at 50% for weapon skills of the same category. This table is for both Double Attack Up and Multi-attack Up. Increases the maximum amount that is healed by the receiver per skill. The Healing Cap Up of the Normal modifier caps at 100%. The Healing Cap Up of the Omega modifier caps at 300%. Increases the damage of Charge Attacks but not the Charge Attack cap. The C.A. DMG of Sentence and Glory caps at 100%. Increases the Charge Attack cap but not the damage of Charge Attacks. The C.A. Cap of Excelsior caps at 30%. The C.A. Cap of Omega Sentence caps at 30%. The C.A. Cap of Normal Sentence caps at 30%. Excelsior, Omega Sentence, Normal Sentence, and Ultima Gauph Key γ are not part of the same cap. Increases the damage and damage cap of Chain Bursts. Glory is an improvement over Sentence and also affects Charge Attack specs. Duration: 8 turns for 8 turns. Multiple 'Betrayal / Preemptive Blade' weapon skills do not stack. Damage increases as HP increases. Does not confer an ATK bonus when <25%. For the SL15 Medium graph, refer to the image at the bottom of this link by Great Sundome. For the SL15 Big graph, refer to the image at the bottom of this link by Hecate_Mk2. Enmity increases Attack in proportion to the percentage of missing HP. Defense increases as HP decreases. See Damage Formula for how DEF influences DMG received. Increases Attack, fixed percentage of max HP as DMG every turn. Skills that only appear on special weapons. Honor applied towards event rewards is increased by 10%. All characters of the same element begin the battle with an attack buff for 8 turns. All of the characters of the same element begin the battle with a defense buff for 8 turns. Increased cut to an enemy's mode bar if in overdrive. If main weapon, deal bonus fire damage to burned foes. If main weapon, gain increased multiattack rate while High Voltage is active. Boost to element allies' damage against weak element enemies (also increases the damage cap by the same amount). Blessing I boosts final damage by 10%. Blessing II boosts final damage by 20%. Reduces damage taken from specified element, 1% reduction per skill level up to SL15, 17.5% at SL20. Reduces damage taken from specified element, 2% reduction per skill level. Duration: Until used at the start of the battle. Cosmos weapons have two skills, depending on their weapon type and class type. The first skill boosts the stats of all weapons of the same type by 30%. This stacks additively with the 20% bonus for preferred weapons. characters have 20% increased Charge Attack Damage. characters have 30% increased Defense and 10% increased max HP Cap. characters have 25% increased healing and heal 200 HP/turn. characters have 20% increased Defense and 20% increased Double Attack Rate. characters have 20% increased Debuff Resistance and 20% increased Debuff Success Rate. This page was last modified on 14 April 2019, at 13:13.